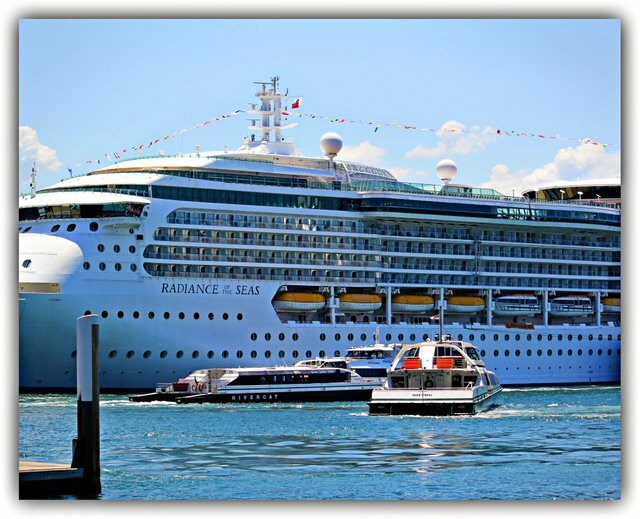 In my previous cruise blogs I shared with you our journey from Brisbane to Sydney by plane, our train trip from the airport to Circular Quay where the Radiance of The Seas awaited our arrival and my overall impressions after inspecting every inch of this ship. See the links below this post for further details. After saying 'Good-Bye' to Sydney we sailed south to Hobart in Tasmania, Australia. 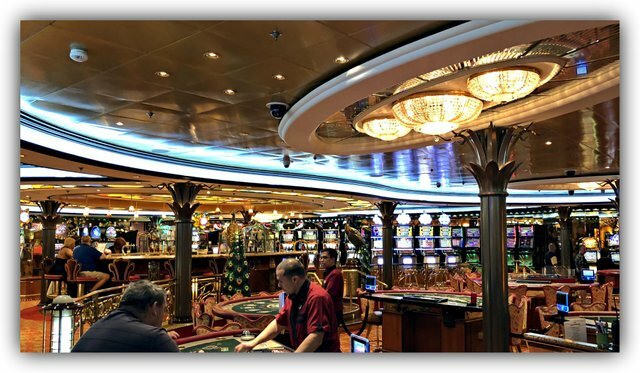 Our nine nights on board were so enjoyable but we also had day excursions to look forward to as well, which for me is one of the main features of cruising. 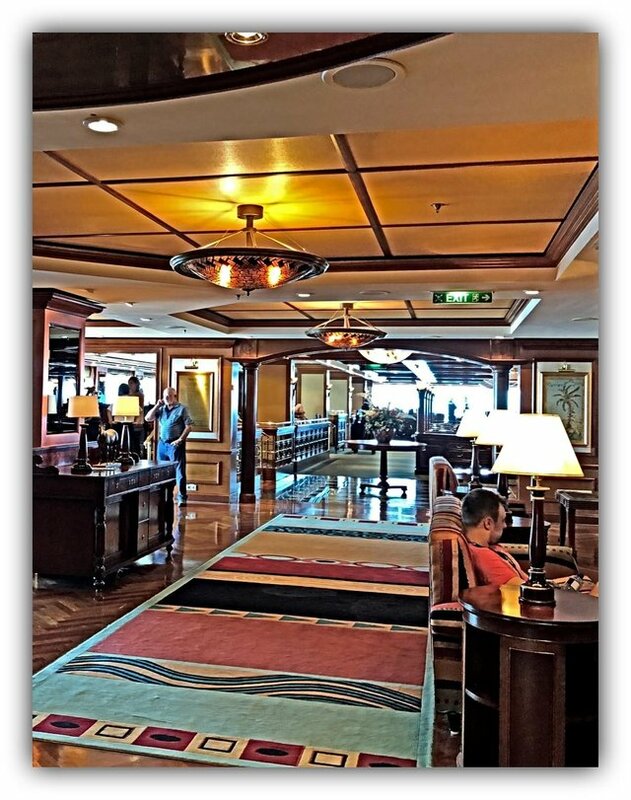 My son who loves cruising, was initially reticent about holidaying on board a ship as he thought he'd get bored. That notion left him within the first couple of hours of getting familiar with the layout and realizing just how much there was to do and see.......in between relaxing of course. 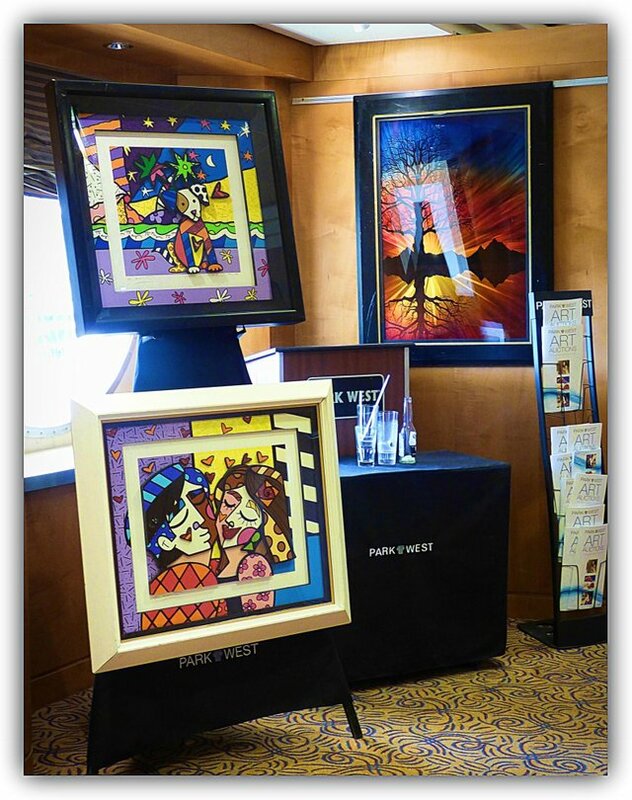 On the day you board the ship you are handed free raffle tickets to attend one of the few Art Gallery auctions they organize during the cruise for the chance to win a free print. I was lucky enough to win two on a previous cruise. They also offer free champagne at the auctions so that's a good incentive to attend at least one of these events. 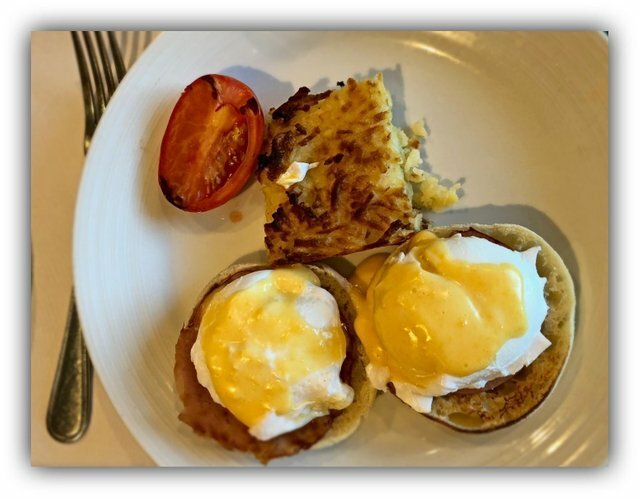 We started each day with breakfast either in the Cascades dining room or Windjammers where you can help yourself to the many tempting dishes from their buffet. If you pick Cascades to dine you are accompanied by mermaids and angels blowing good vibes down on them from their fluffy clouds in the skies. But the choices.......Oh the choices! It is so difficult to decide what to indulge in, not just for breakfast but for every meal. I'm sure all the mental activity uses up a heap of calories so the the 'exercise' of eating reduces the burden of guilt for consuming more than what I would normally. 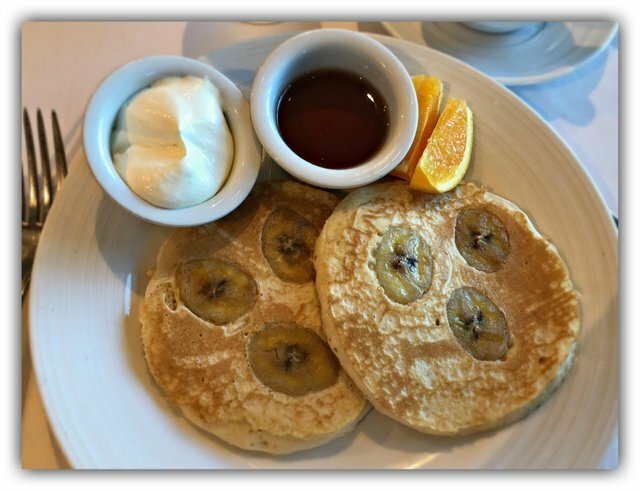 So, will I have banana pancakes with maple syrup and whipped cream? Or eggs benedict with hashbrowns? 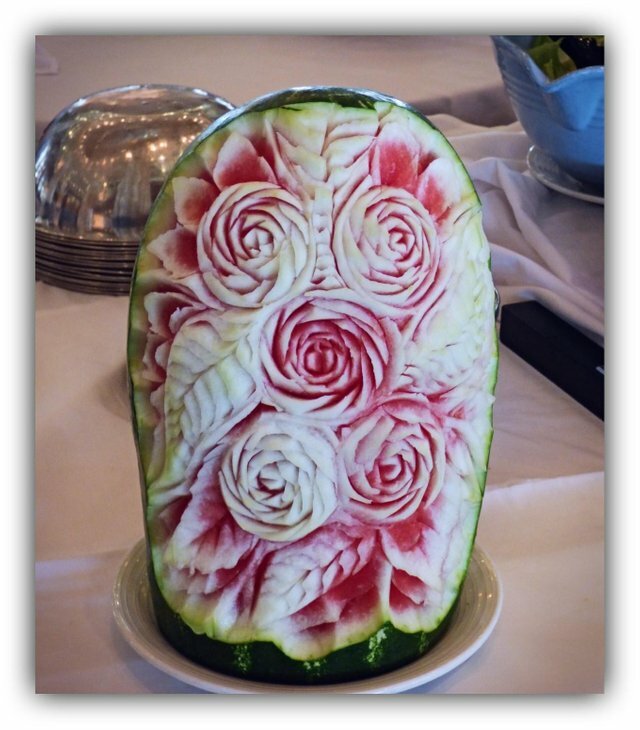 There is always plenty of fruit to balance the diet, not that I'd take a chunk out of this beautifully carved watermelon. The floral designs crafted on this one is truly a work of art wouldn't you agree? After a while you forget you are on board a ship as the layout is so spacious. You'd swear you were entering a plush hotel foyer in this photo. The Centrum is a focal point both day and night as there is always some form of entertainment available to enjoy whilst having a leisurely coffee from the cafe or an exotic cocktail from the bar. 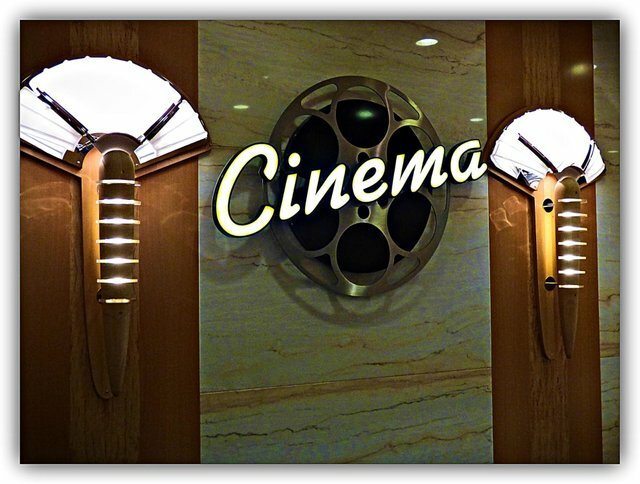 If you like movies the Cinema is a good option for whiling away a few entertaining hours. 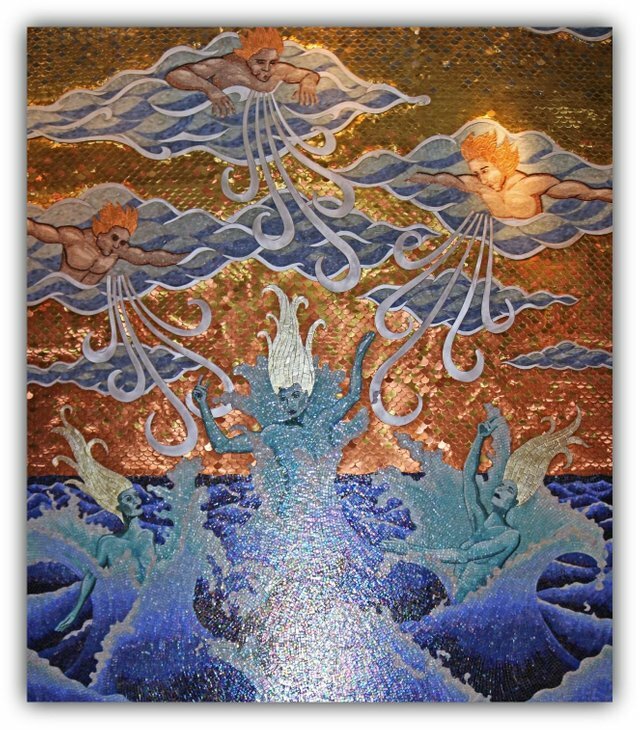 You have to be quick to get a good seat on the sea days though as it is a popular recreation. Now why would I show you inside the 'Ladies Room? Simply because I am thorough and didn't want to leave anything out of my cruise blogs. 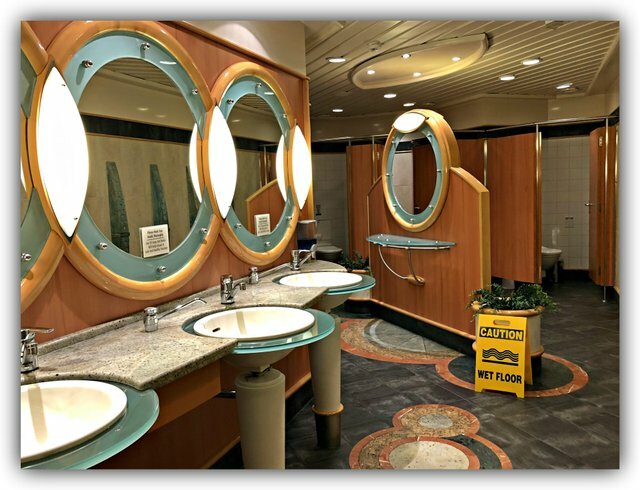 And besides, where else could you find port hole shaped mirrors to assist one when touching up their make up in between shows or meals? The casino is worth visiting just to admire the decor. 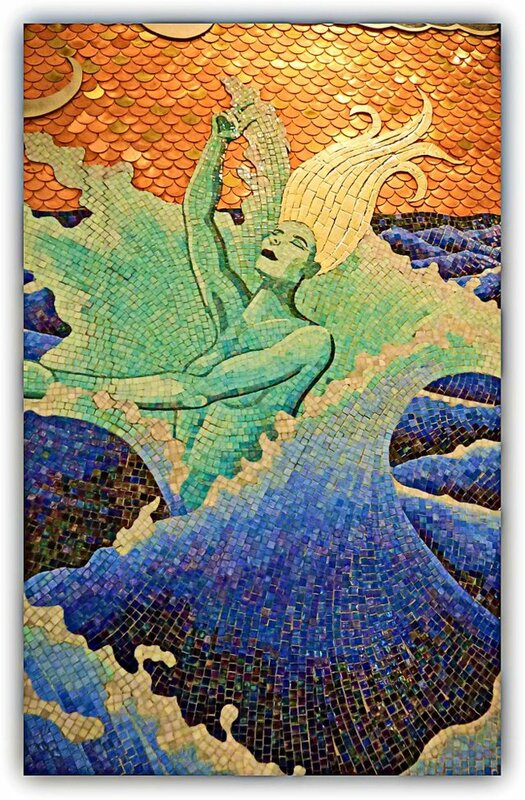 I captured quite a few shots of this one as I was very impressed with the stained glass murals etc, but that will have to wait until my next cruise blog. Is it time for dinner already? Sigh! I have to tell you; the beef on this dish was the nicest I have ever eaten in my life. It was tender, tasty and very delectable. This three man band were fabulous. Their repertoire was impressive as was their talent with singing and playing a variety of instruments. At the end of their set pieces they would ask the passengers if they had any favourite songs they'd like them to sing? I don't believe I heard them decline any requests which was quite incredible. 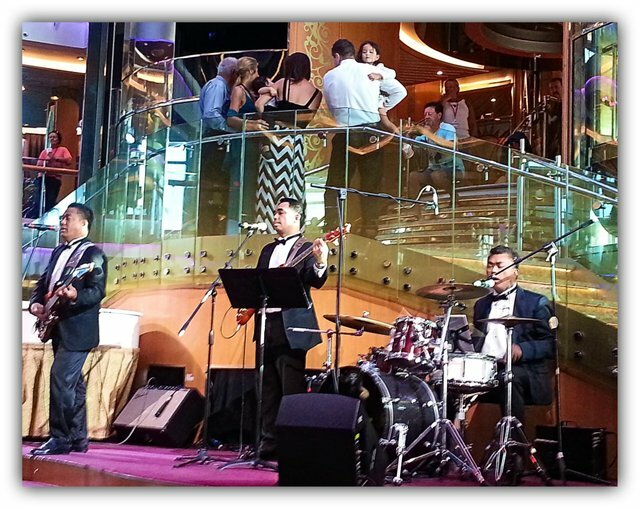 Listening to professional musicians like this was the perfect way to end a perfect day on The Radiance of the Seas. 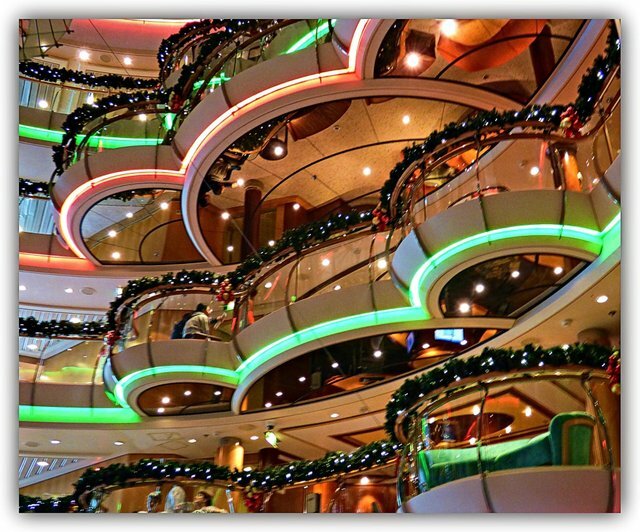 Check out my previous Radiance Cruise blogs if you haven't seen them already. It will give you an informative overview of this amazing ship and all she has to offer, but I must warn you, the longing to hit the high seas in style will be hard to resist. THANK YOU FOR VIEWING. HAVE A GREAT DAY. My wife and I went on a cruise for our honeymoon. This really brings back some memories! Thanks to @seyiodus, this post was resteemed and highlighted in today's edition of The Daily Sneak. Thank you for your efforts to create quality content! This post has been voted on by @acropolis photography in collaboration with the project @templo. Hello, @trudeehunter. Your post has been manually curated by Altruistic community and has been resteem. Howdy Trudee! oh my gosh I SO want to go on a cruise! lol. That looks fabulous! You would love it John. You must do it one day, I would thoroughly recommend you take Mrs J on a cruise of a lifetime. Amazing cruise ship!! 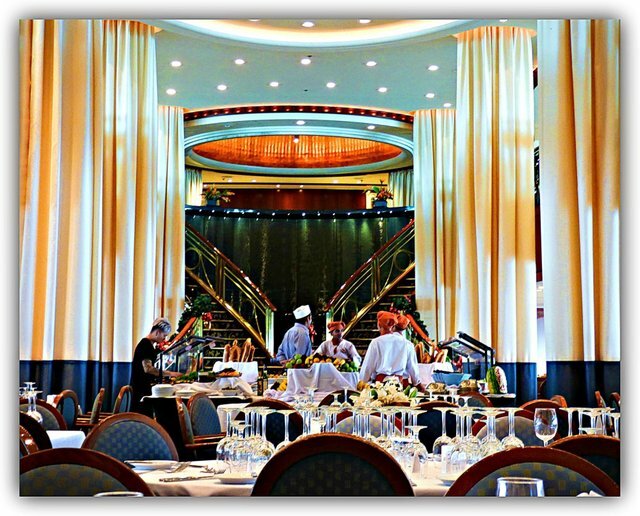 I would never have thought I could survive more than a day on a cruise ship! This report really has changed my mind forever! This is like floating five stars hotel with a casino as well!! I think you ought to get more whip cream with your pancake!!! Hope you’ll get a free print again!! 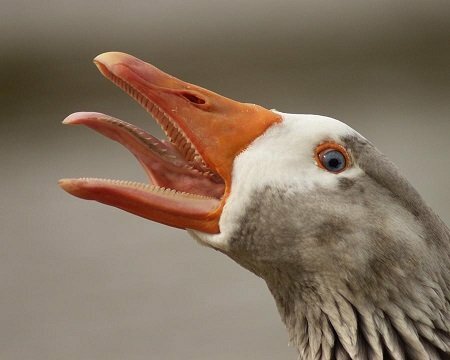 You just got a Team NZ upvote! I'm very happy you enjoyed this cruise blog dear Neli. Sorry there are such big gaps between posts. The food is very hard to resist but after the first couple of days, I'm happy to reduce my meals to 2 a day and I'll take the stairs rather than the lifts whenever possible to keep up my exercise. That looks like fun... but the eggs benedict look amazing! It looks as if the design team had a lot of fun with the ship. I was a tad disappointed in the "wet floor" sign, though. They should have a fancy one to match! Fun it was @fotosdenada...... plus a whole lot more. I wasn't disappointed to see the "wet floor" sign because it shows that the cleaners are doing a good job. 😊 But I do see your point. They could have painted the words in gold leaf couldn't they? Well, I did live the high life 15 months ago when we did this cruise Jo. 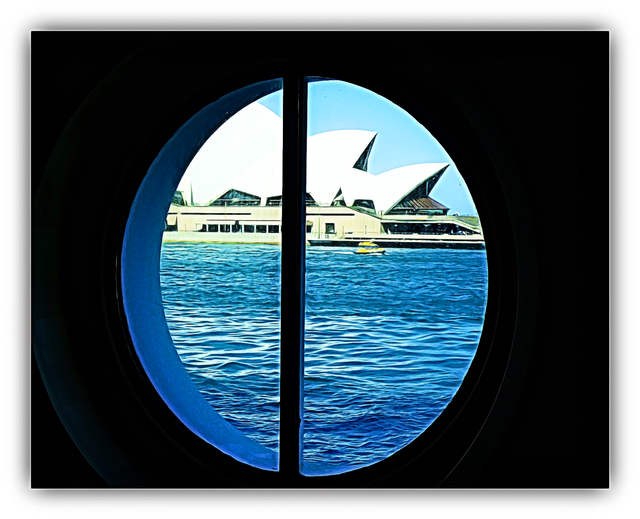 It's taken me a while to get these blogs organized but when I do them I have vivid memories of the joy of this cruise and others I have done in the past. 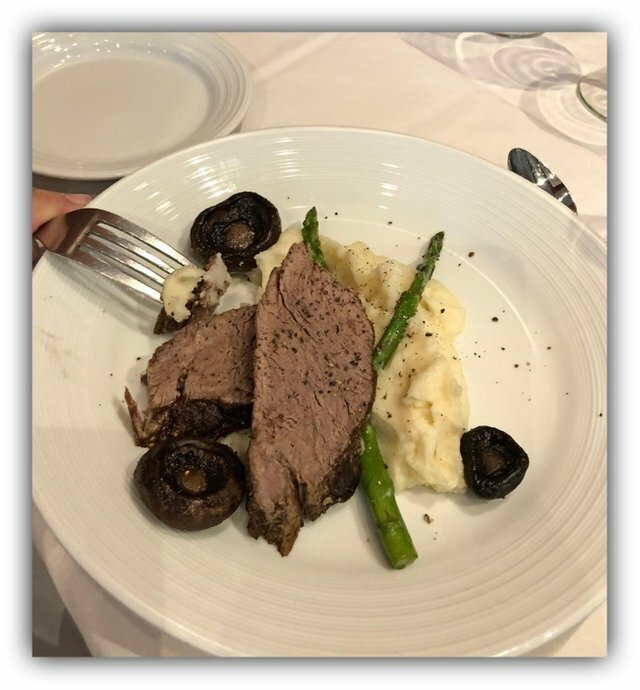 It is our preferred way of traveling as is a lot more affordable than hotels and most holiday packages because it includes travel expenses to a variety of places plus all our meals. @ocdb is a non-profit bidbot for whitelisted Steemians, current max bid is 60 SBD and the equivalent amount in STEEM.